Back when the Nintendo Enternainment System (NES) gaming console was the king of your home, you probably spent several countless hours playing the best games of this era, including, of course, Super Mario Bros., The Legend of Zelda, Metroid, Mega Man, Castlevania or Contra. Probably wanting to avoid such a situation, Jay Pavlina offers a very faithful Flash-based reproduction of the original Super Mario Bros. game, with all these characters. Thus, you can now choose to replay all the original game levels with any character, continuously or alternatively, with original music score from each game! The main feature of this game, apart from its flawless realization and awesome authenticity, being to reproduce all the physical strenghts of each character. As a result, Mario can still swim, run, break walls vertically or throw fireballs, but only with the right power... while Link or Samus will be able to use weapons anytime, to kill enemies or break walls horizontally (but not vertically), but won't be able to swim or run. 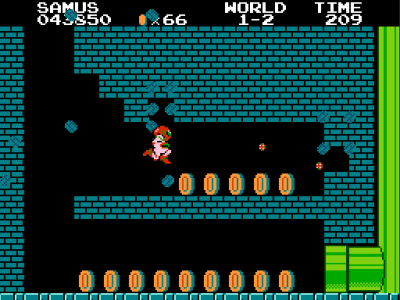 Of course, the game has been designed to suit the characters' different abilities, and brings some interesting new features compared to the original Super Mario Bros. game: you'll be able to choose a different character between each level (each player keeping the bonuses acquired through previous levels), or go backwards in each level, which can be extremely useful. An awesome creation, whose lightning fast and sudden notoriety (more than a million players in less than 48 hours) is well deserved, as the author indicates he spent over 8 months on its development. This game has been initially published on NewGrounds, before being replicated extremely quickly on hundred of websites. That's why I invite you to discover this game on this first website, as the author says that NewGrounds will probably be the first where he would publish future updates. Moreover, I strongly recommend you to visit his own website, Exploding Rabbit, where he thanks all people who are enjoying his first creation, well beyond his expectations.